It is no surprise that magazine sales on the iPad have fallen since the summer, as the novelty of pawing through a publication on the new toy wore off. In the most extreme case of fatigue, Wired sold 100,000 copies of the first issue it put on the iPad in June but only about 22,000 in November, according to statistics culled from the Audit Bureau of Circulations and first reported at Women’s Wear Daily. 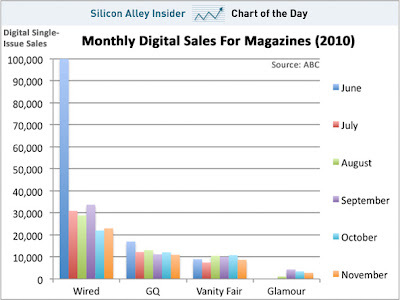 The chart below is from Silicon Alley Insider. A sale of 22k issues isn’t all that bad, since it represents $87,780 in almost pure profit at $3.99 a copy, but publishers seeking to build iPad volume would do well to read the disappointing reviews of the Wired app on the iTunes page where the magazine is sold. With iPad apps, Groupon-like buying programs and Twitter campaigns topping the to-do lists at most newspapers, it’s time to place these putative publishing panaceas in proper perspective. Recent research into consumer acceptance of these varied ways of serving readers and advertisers has found that each initiative may lead to underwhelming results, unintended consequences or, in the worst cases, both. This doesn’t mean they should be written off. It just means that publishers need to look and plan carefully before they leap. Publishers eager to export their print product to the iPad will be heartened to know that the device is a hit among exactly the sort of wealthy, middle-aged men who read newspapers. The problem is that 58% of iPad users think the device is such a good substitute for print that they are “very likely” to cancel their print subscriptions in the next six months, according to a recent survey by Roger Fidler at the Reynolds Journalism Institute at the University of Missouri. More than 30% of the 1,600 iPad users polled by Fidler have not recently subscribed to a newspaper and another 11% of them already have abandoned their print subscriptions in favor of the tablet. Although new circulation rules allow publishers to count iPad subscriptions as paid circulation, newspapers have yet to find a way to extract as much advertising revenue from the digital media as they can from the print product. In fact, many publishers complain that digital advertising turns print dollars into dimes. Given the danger that attractive iPad renditions of the legacy product could lead to cannibalization of some of the most loyal newspaper readers, publishers have to ask themselves whether they really want to build these sorts of apps. An alternative to porting the daily paper to the iPad is to use the platform to develop new and differentiated products to serve new audiences and advertisers. You know enthusiasm for an idea is dangerously out of control when an entrepreneur is so full of himself that he turns down $5 billion from Google to buy his company. Considering the seemingly ephemeral nature of his business model, Groupon founder Andrew Mason really ought to tell Google he was just joshing. The problem with Groupon is simple and profound: Thirty-two percent of merchants who used Groupon to offer deep discounts to stimulate their businesses report that they lost money on their deals, according to a survey released in the fall by Utpal M. Dholakia, a professor of marketing at Rice University in Texas. But, wait, it gets worse: Of the 150 merchants responding to the survey, 42% said they would not do another Groupon promotion. And that includes some of those who made money on their deals. While merchants love the instant influx of cash associated with offerings through Groupon and the host of imitators that have sprung up to capitalize on the phenomenon, businesses ranging from McDonald’s to flying schools struggle to fulfill the deals. This sad story is not untypical. Some consumers feel ripped off, too, when they are unable to redeem the prepaid certificates they bought for massages, dinners, classes and other goods and services. In an online survey at HubPages.Com, 44% of consumers called Groupon a “scam” and 28% thought it was “very good. The balance of respondents were neutral. The lesson is that merchants have to be trained to thoughtfully and carefully use blitz offers to build long-term customer loyalty – not as churn-’em-and-burn ’em ATM cards. Will tweeters turn into readers? Although Twitter will tell you that it has 175 million registered users and investors reportedly deem it to be worth $3.7 billion, fewer than 20 million American adults actually use the service, according to new research from the Pew Internet & American Life Project. Pew also discovered an interesting dichotomy: A quarter of users avidly check for the latest tweets several times each day but a fifth of the registered users never use their accounts after they open them. This indicates that Twitter, at best, may be effective in reaching only the limited cohort of consumers who crave a steady diet of 140-character News McNuggets. The abbreviated attention spans of Twitter addicts suggests that most of them could be turned off by the windy and often-dreary articles that characterize a great deal of newspaper coverage. If newspapers aim to exploit this channel, they will have to learn how to keep things short and tweet. Newspaper advertising revenues continued sinking in the third quarter of this year despite a robust recovery that has fueled healthy gains in all – not some, but all – of the other competing media. 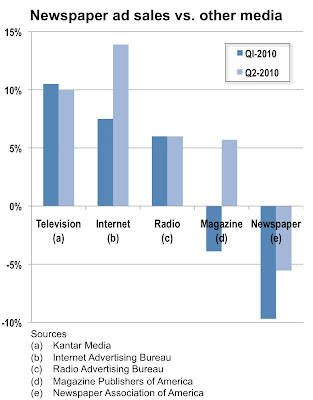 While television, radio, magazine and Internet ad sales have moved into positive territory in 2010 after suffering recession-related setbacks in the last two years, newspaper revenues dropped another 5.4% in the third period, marking the 17th quarter in a row of revenue deterioration. Total print and online sales in the three-month period ended in September were $6.1 billion, or almost half of the all-time, third-quarter high of $12 billion achieved in 2005. The Newspaper Association of America, an industry trade group, released the sales figures yesterday. While John Sturm, the chief executive of the NAA, characterized the industry’s performance in the third quarter as “a continuing and encouraging trend toward recovery and growth for newspapers,” the objective fact is that newspaper advertising has continued to shrink at the same time sales have improved handsomely for all of the other mass media. As illustrated in the chart immediately below – which shows ad performance in the first half of the year because third-quarter data are not yet available for the competing media – television and Internet sales advanced by double-digit levels. Radio maintained a consistent 6% growth rate and magazines moved into the black in the second period after suffering sales declines in the first three moths of the year. But newspapers did not join the party. 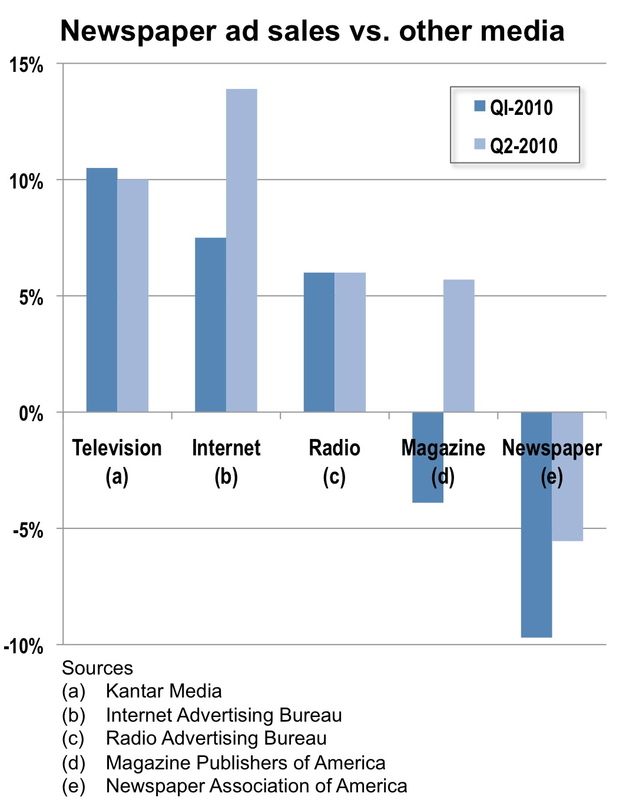 Although the decay in newspaper ad sales has declined in each of the three quarters of 2010, the industry is the only one of the mass media still in negative territory. The decline in newspaper sales has persisted in every single print category since mid-2006. The only area showing growth for newspapers this year is online advertising, which represents an average 11% of industry ad sales. While digital advertising advanced a welcome 10.7% to $689.8 million in the third quarter, the gain was hardly enough to offset the weaknesses among the other ad groups. :: Real estate classified fell the most, plunging 15.7% to $302 million. 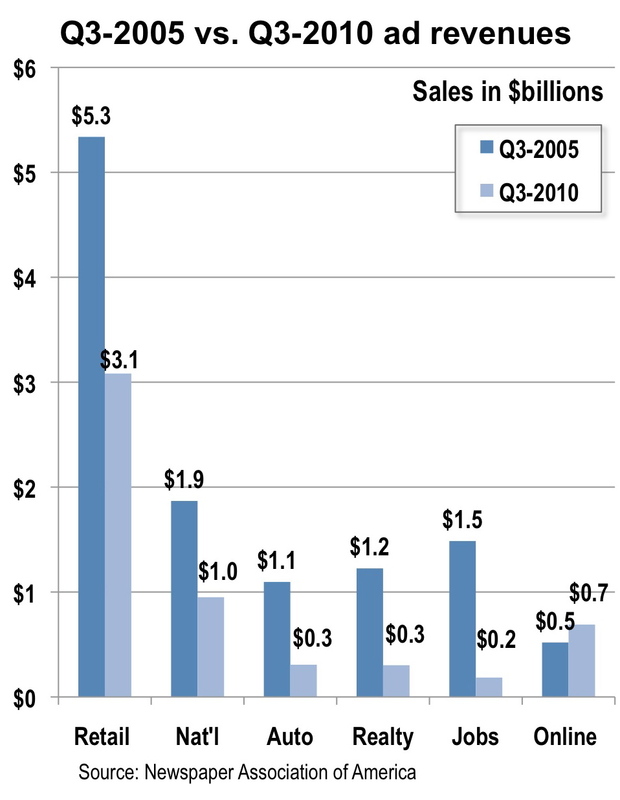 In the third period of 2005 (as illustrated in the chart below), this category generated $1.5 billion in sales. :: Retail, the single largest source of advertising for newspapers, slid 9.3% to $3.1 billion vs. $5.3 billion in 2005.
:: Automotive classified tumbled 4.4% to $308 million vs. $1.1 billion in 2005.
:: National slipped 0.6% to $950.5 million vs. $1.9 billion in 2005. 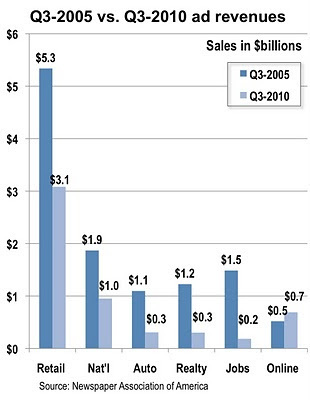 On a positive note, recruitment advertising in the quarter rose 5.0% to $184.5 million, but it unfortunately is well below the $1.5 billion sold in 2005. It’s time to retire the difficult-to-achieve and impossible-to-defend conceit that journalists are now, or ever were, objective. Let’s replace this threadbare notion with a realistic and credible standard of transparency that requires journalists to forthrightly declare their personal predilections, financial entanglements and political allegiances so the public can evaluate the quality of the information it is getting. It is preposterous to think anyone ever believed that journalists – who, for the most part, are restlessly intelligent and relentlessly skeptical individuals – actually were able to intellectually neuter themselves when they sat down at a keyboard or stepped in front of a camera. For most of the history of the republic, political partisans typically funded newspapers for the express purpose of promoting their friends and pummeling their enemies. Objectivity was not their objective. As the newspaper industry began consolidating in the 20th Century, the sole surviving publishers in most markets realized they could sell more papers (and therefore, more ads) if they purged partisanship from their columns. Some publishers were more assiduous than others, but most of them played it relatively straight in the era after World War II. Broadcasters embraced the concept of neutrality in the interests of building the largest possible audiences for their shows (so they, too, could sell more ads). As a welcome side benefit, this avoided potential unpleasantness with the federal officials who doled out broadcasting licenses. This all worked fine until the Internet came along and provided self-appointed critics of every stripe with unlimited opportunities to vent their misgivings about the news – and the messengers delivering it. Confidence in the media eroded accordingly. A recent Gallup poll found that a record 57% of Americans said they had little or no trust in the mass media vs. 44% who were skeptical in 1999. While I don’t believe the traditional news media are materially less trustworthy today than they were 10 years ago, faith in the press has faltered, in part, because so many people are picking at it. However, I would submit that the biggest reason distrust in the press has increased is that a growing number of journalists – particularly those on Fox News, MSNBC, talk radio and other popular venues – are expected to inject personality, passion and even partisan spin into their work. This trend is unlikely to abate, as long as Fox News – which is about as fair and balanced as Roger Ailes is fit and trim – can pull a larger audience at 10 p.m. on election night than each of ABC, CBS, CNN, MSNBC and NBC. If anything, the passion for passion is likely to grow. With on-air histrionics at a fever pitch, distrust has spilled over to the print media, too, contributing to a pernicious decline in newspaper readership that has dropped circulation by 37% in the last 20 years. Today, only one in three households actually takes a newspaper. Unsettling as the punditization of the news may be to old-school journalists, there is a powerful cultural reason why Fox, Jon Stewart and other news-with-a-view productions have caught on: Consumers are so overloaded with information that they want someone to tell them what it means. No fewer than 92% of Americans today “use multiple platforms to get their daily news,” according to a survey conducted earlier this year by the Pew Research Center. However, 70% of respondents felt the volume of news was overwhelming and 50% said they looked to others to help them divine its significance. This represents a golden opportunity, if you believe, as I do, that journalists not only possess valuable insights into the matters they cover but also have an absolute obligation to share their perspectives with the public after diligently gleaning all sides of a story in an ethical and open-minded manner. For journalists to be able to report effectively on the news and its significance, we have to replace the intellectually indefensible pretense of objectivity with a more authentic standard that journalists actually can live up to. Let’s take advantage of the openness and inexhaustible space of the Internet to have every journalist publish a detailed statement of political, personal and financial interests at her home website and perhaps even in a well publicized national registry. Full disclosure would enable consumers to make their own informed judgments about the potential biases and believability of any journalist. This standard will work as well for journalists and media outlets committed to down-the-middle reporting as those desiring to express a point of view. A superb example of how detailed disclosure could work can be found at AllThingsD.Com, where co-editors Kara Swisher and Walt Mossberg unsparingly bare their personal interests. It’s time for everyone else to do likewise.